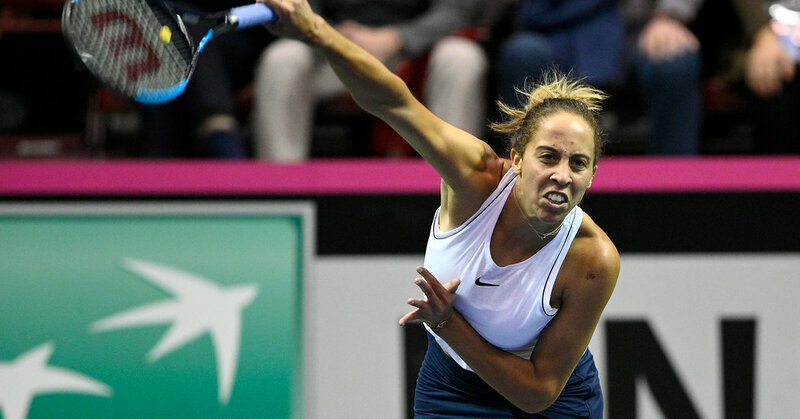 Madison Keys kept the United States from being in a big hole against Australia by routing Kimberly Birrell, 6-2, 6-2, on Saturday in the Fed Cup quarterfinals in Asheville, N.C.
Keys’s victory came after Ashleigh Barty posted a 6-1, 7-6 (2) victory over Sofia Kenin earlier in the day. Keys and Barty will square off Sunday with the best-of-five matches tied, 1-1. Avoiding an 0-2 deficit was crucial for the United States, which lost to the Czech Republic in last year’s final. The Czech Republic split two matches against visiting Romania. Simona Halep -of Romania rolled past Katerina Siniakova, 6-4, 6-0, and will face Karolina Pliskova on Sunday. Pliskova earned a 6-1, 6-4 win over Mihaela Buzarnescu but has struggled against Halep, who has a 6-2 lead in their head-to-head meetings. “Six-two is fine — the match starts from zero-zero, so there’s going to be a chance for both of us, never mind what happened in the past,” Pliskova said. “I just have it in my head that I beat her when we won,” against Romania in the 2016 Fed Cup quarterfinals. Belarus owns a 2-0 lead over host Germany after Aliaksandra Sasnovich defeated Tatjana Maria, 7-6 (3), 6-3, and Aryna Sabalenka soared past Andrea Petkovic, 6-2, 6-1. The winner will take on the United States or Australia.